Discussions Magazine Music Blog: SPAZ reviews the new ASIA album, OMEGA! 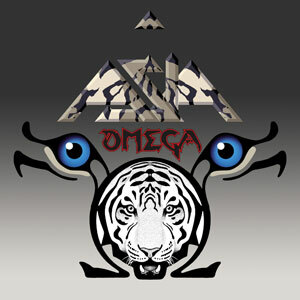 SPAZ reviews the new ASIA album, OMEGA! For the rest of you, sit down and enjoy the ride because Omega is a joy from start to finish. Since comparisons are unfortunately part of the review process, let me tell you that while there are no instant Top 40 hits on this silver platter, it is jam packed with great moments that we've come to expect from the band. There's definitely an Asia sound that is built around the creative talents of four very different individuals: John Wetton (bass/vocals), Geoffrey Downes (keyboards), Carl Palmer (drums) and Steve Howe (guitars). That 'sound' can only be created by these four individuals. When Wetton & Downed record outside the Asia axis, it is fabulous, but doesn't try to pretend to be Asia. When Downes took the Asia name through the '90s with a whole new line-up, they created some amazing music, but it just wasn't Wetton/Downes/Palmer/Howe. All four members are extremely talented musicians, but something happens when they come together. On paper, when Asia first came together, these Prog Rock veterans were expected to create a Prog masterpiece with lengthy songs filled with needless solos and guitar noodling. Instead, they broke the music down to it's basic elements and wrote melodic Rock songs that sounded great on the radio and sounded even better in an arena. The songs were hook-laden but far from simple. In Asia's music, there are many layers for the listener to enjoy and discover with each subsequent spin. When the the original line-up reunited and released Phoenix in 2008, their unique sound was intact and just as vital as ever. Two years on, Omega finds Asia even more comfortable than before. It also shows the band able to stretch out a little more and relax. There are moments of warm earthiness on Omega, followed moments later by something grandiose and glorious. Howe's guitar is not always 'in your face' but certainly ever present. Wetton's voice sounds better than ever and that wall of harmony vocals still sounds powerful and intoxicating. Downes' keyboards are seldom used as a lead instrument yet they lay down the musical foundation for each and every track here. Since the quartet are Prog veterans, it'd be difficult for them to avoid those Prog tendencies altogether and Omega does contain a few delicious moments where Howe and Palmer really get to show off their 'skills'. Generally, though, the tracks veer from Beatle-esque to Asia-esque and everything in between. Although they aren't as immediate, there's more melodies on Omega than you'll find in most bands' entire catalog. As the listener, you just need to lay back and let the album wash all over you a few times. With key tracks like "Finger On The Trigger", "End Of The World", "Listen, Children" and "I'm Still The Same", Omega is yet another fine slice of Asia magic that is truly unique. They are band that are truly in a league of their own.